The KRONOS, the world's first 'T' rated, CE certified technical ice climbing tool made from organic material. Using wood offers a softer swing with increased placement sensitivity, while keeping hands warmer. 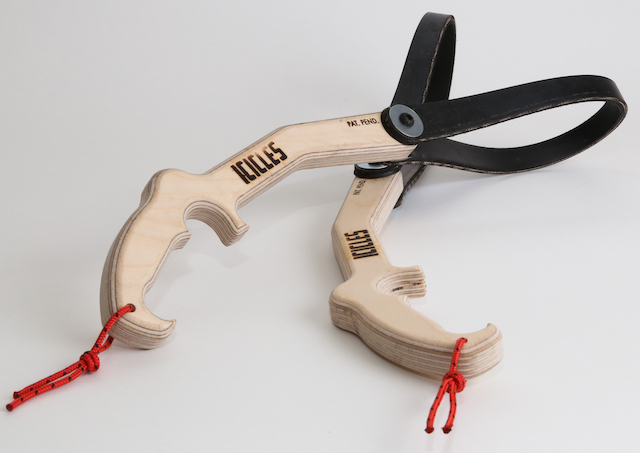 The original and still the best gym safe indoor ice & mixed climbing training tools. 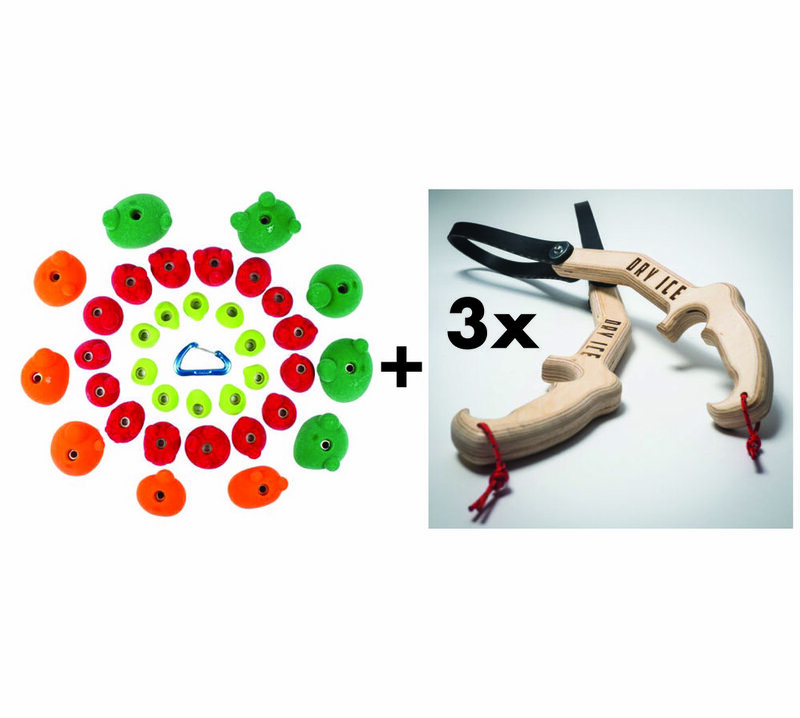 Youth-sized DRY ICE Tools for kids 11 and under and climbers with smaller hands. Pack of 35 Holds and 3 Pairs of DRY ICE® Tools. Enough to set at least 3 routes and put your gym on the map with Alpinists, Dry Toolers, and Ice Climbers. Because what’s better than customers? More customers! The KRONOS® is the world's first 'T' rated, CE certified technical ice climbing tool made from organic material. Sold individually. More information HERE. Available worldwide. Simply choose your nation at checkout. It is the most gorgeous ice tool I've ever used, and it feels great. Stays warmer in the hand, shocks are attenuated by the wood. Great balance of aggressiveness for mixed and technical climbing along with smooth function for WI climbing. Best tools out there. I tried them all. It's in the thwak! I recently had the opportunity to try a pair of Kronos at the Michigan ice fest. With the temperature at -8 deg. that morning I figured it would be a good test. First impression upon gripping the handle is its size. Seems a bit on the fat side. To me, this is a great since I have long fingers. It's a very comfortable grip! The overall weight of the tool is very good. Not the lightest and definitely not a sledgehammer. Since the pic extends into the handle a few inches the balance is slightly different. This was a plus tapping into the hard brittle ice to get that sucker to stick. It just seemed easier to control. If a fast heavy swing is required then they perform like any other tool in my opinion and trust me I beat the crap out them, they are tough! They say the wood will help with cold hands. I'm not going to say my hands were warm due to using a wooden tool but they stayed comfortable wearing BD Arc gloves, not the warmest glove out there. Overall I think it's a great tool. If you can't climb with these tools you can't climb! ( yes I stole that) The End! Used the axes today at Ouray Ice fest and they were awesome!! So light, with a good amount of weight in the head to really drive the axe in :) and, they stay really warm! So important on those really cold days. 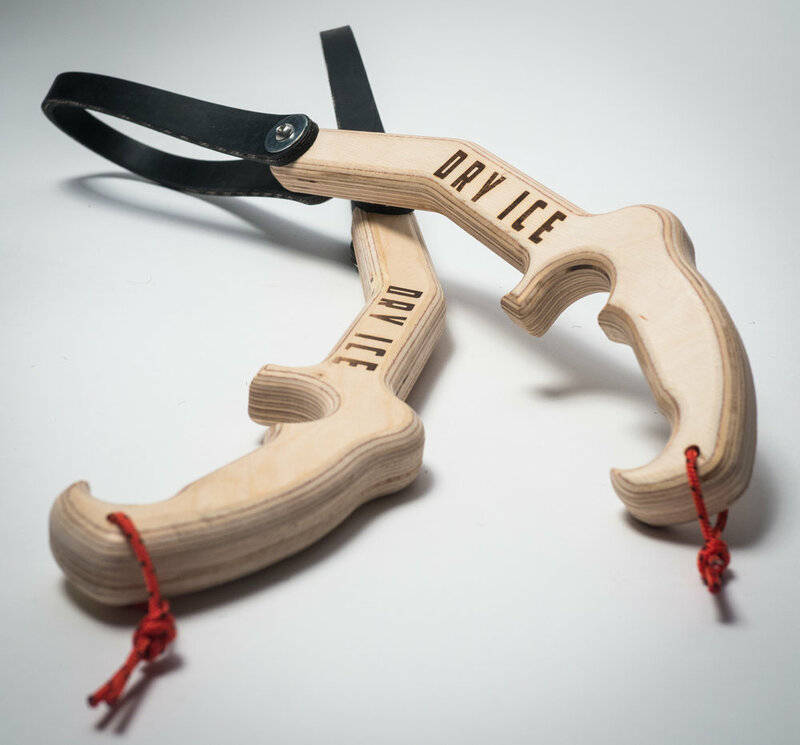 DRY ICE® Tools are patented Indoor Ice Axes used by looping stiff rubber straps over the holds used in rock climbing gyms. The climbing motion is exactly the same as when ice or mixed climbing. Now you can prepare for the upcoming ice season, in your gym, without worrying about injuring someone or puncturing the pads with sharp points raining down from above. Sold in pairs. Don't forget to purchase TETHERS! Available worldwide. Choose your nation at checkout. We developed ICICLES® in response to overwhelming requests from our customers for a tool with a slightly smaller handle for climbers with reduced volume hands. ICICLES feature a similar handle design as our popular DRY ICE® Tool with one major difference, the handle size has been reduced by 30%. The strap design is the same as our on our full size DRY ICE Tool, making the straps interchangeable between tool sizes. Save $72 with this Starter Pack of 35 Holds and 3 Pairs of DRY ICE® Tools. Enough to set at least 3 routes and put your gym on the map with Alpinists, Dry Toolers, and Ice Climbers. Because what’s better than customers? More customers!